In addition, Tadas Viskanta at Abnormal Returns made a compilation of blogger wisdom about smart beta, which includes my contribution (see The dirty little secret behind smart beta investing). There's lots of good stuff there. The consensus seems to be that while smart beta funds and ETFs have their uses, they are no magic bullets and investors have to understand exactly what they're getting into when they buy. The new site is now re-open for new subscribers. We closed our site to new subscribers in January in order to better control the rapid growth of our community. After listening to feedback and making a few tweaks to the site and the content, such as the addition of a mid-week technical update, the site is now re-open for business. You can subscribe for 1 year﻿ (US $249.99), 1 month﻿ (US$24.99) or 1 day (US$4.99);. Even if you are not ready to subscribe, you can always sign up for email notification of free posts as they are free and available to the public two weeks after publication. We would love to see new members in our community. Come over and take a look. I've been meaning to write on this topic but I hadn't gotten around to it. For several weeks, I have seen warnings about deteriorating earnings quality. The gap between corporate earnings as defined by Generally Accepted Accounting Principles (GAAP) and operating earnings (earnings without the special bad stuff) has been widening to levels not seen since the last market crash. Here is a chart from Zero Hedge which showed that the gap between GAAP and Non-GAAP earnings is at its worst since 2008. The level of write-offs are absolutely horrendous. On the other hand, this chart from Goldman Sachs is suggestive that these earnings "gaps" occur at the height of bear markets. If we are already through the worst of these writeoffs, could such a development be actually equity bullish? 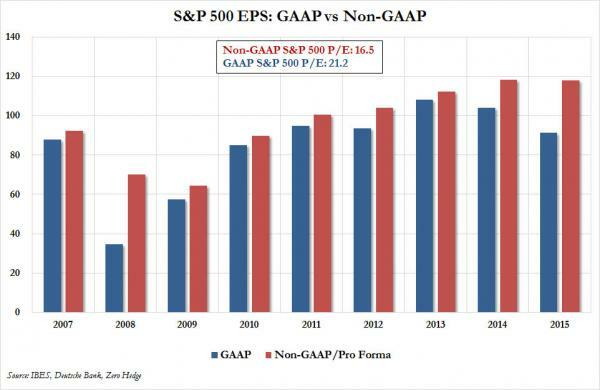 Urban Carmel also pointed out that outside of recessions, the "GAAP gap" actually isn't that bad on a historical basis. 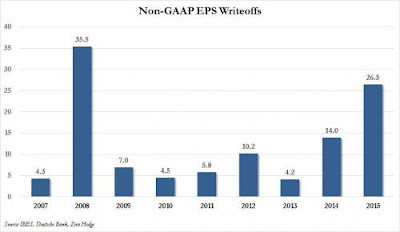 Interpreting the GAAP earnings quality gap is like the Rorschach inkblot test. Bullish or bearish? What`s the real story? I have been asked in the past to describe my brand of market analysis, which can be characterized in a number of ways. Technicians would call my approach inter-market analysis. Fundamentally driven investors may regard me as a global macro or cross-asset analyst. That`s because all markets are inter-connected and to simply focus at any single stock, sector or market in isolation misses the big picture. Analyzing different components of the big picture also allows me to write about topics as diverse as the US equity market, the term structure of the VIX Index (see Sell Rosh Hashanah?﻿), Europe (see The costs of Spain's astounding recovery: Bug or feature?﻿) and China (see Big Trouble with 5-year China﻿). To illustrate my point, I would like to show why I believe that the US Dollar holds the key to the medium term outlook (6-12 months) for US equities. As the chart below shows, the Trade Weighted Dollar has seen a clear breach of an uptrend line, which has bullish implications for equity bulls. Mid-week technical update: I wrote on the weekend that I expect that the stock market would continue to rise on an intermediate term basis, but some short-term weakness was likely (see A repeat of the failed Oct/Nov rally of 2015?). What I did not expect was to see a short-term buy signal after the brief weakness that we saw today (Wednesday). In retrospect, it was easy to see that a pullback was coming. 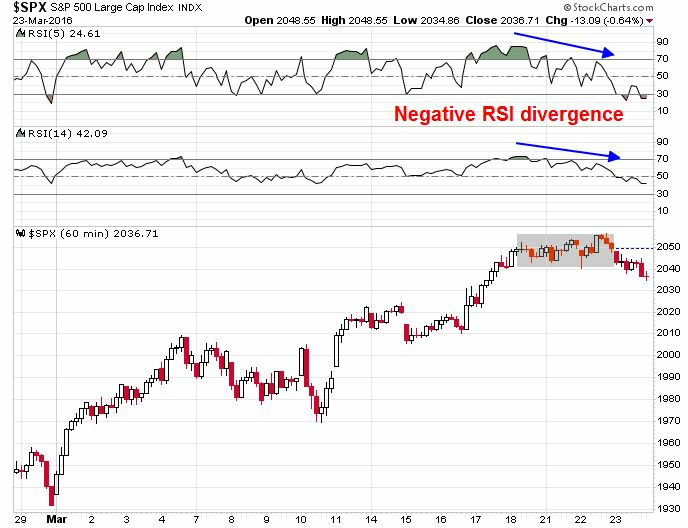 This hourly chart of the SPX shows negative divergences on RSI-5 and RSI-14, which set up the conditions for the fall in prices. 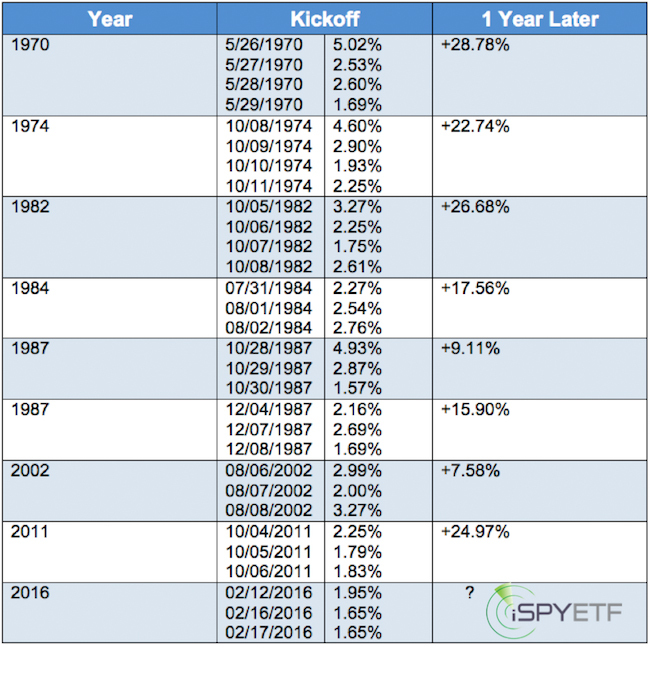 Big Trouble with 5-Year China? China's latest five-year plan seems to be a big hit. What's more, the most recent growth slowdown is abating, the stock market is recovering, but my indicators are suggesting that, despite all of the glowing rhetoric, the economy is taking a step back in its path towards re-balancing growth towards the household sector. I am happy to announce that the new site is now re-open for new subscribers. We closed our site to new subscribers in January in order to better control the rapid growth of our community. After listening to feedback and making a few tweaks to the site and the content, such as the addition of a mid-week technical update, the site is now re-open for business. If you teach a man how to fish...he'll want to get a boat. We would love to have you join our community. We stand ready to help you build your own boat. Come over to the new site and take a look. A repeat of the failed Oct/Nov rally of 2015? 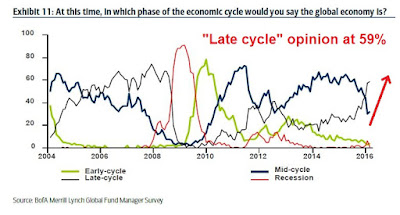 In the last few weeks, I had been writing about a transition to a late-cycle market. The latest results from the BoAML Fund Manager Survey show that 59% of institutional managers believed that we are in the late-cycle phase of the expansion cycle. The 59% figure is the highest reading since August 2008. A late-cycle expansion is characterized by tightening capacity, falling unemployment, rising wage and other inflationary pressures, which are ultimately followed by tight monetary policy. The current macro environment is indeed seeing signs of tighter employment and modest inflationary pressures. A couple of months ago, the markets had been wrongly focused on the risks of impending recession. We are now seeing a reversal and a FOMO (fear of missing out) reflationary rally in stock and commodity prices. 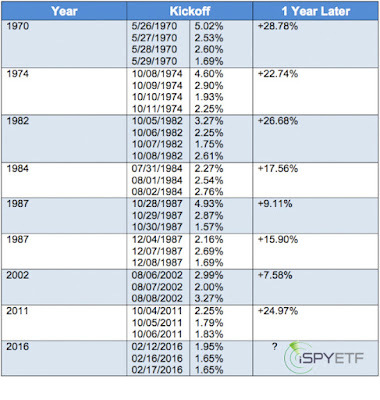 Mid-week update: I thought that I would write my mid-week update a day early, because of the binary outcome of the FOMC meeting. This meeting could turn out to be a critical turning point for the short and medium term tone of the markets. 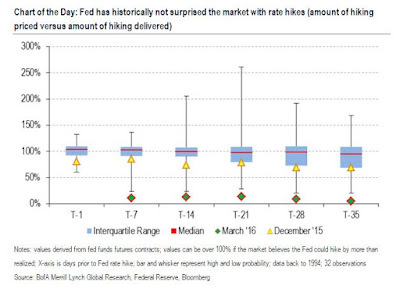 It`s becoming fairly clear that the Fed is unlikely to raise rates at its March meeting. Marketwatch highlighted analysis from BoAML indicating that the Yellen Fed has not historically surprised the market with rate hikes. 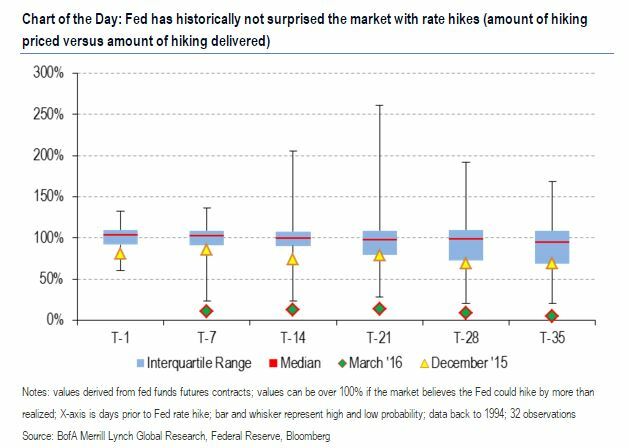 If the Fed were to raise rates either at its April or June meeting, now is the time to start telegraphing that move. Here is what`s at stake as we await the FOMC announcement. I know that Apple (AAPL) has made various legal arguments about why they shouldn't be compelled to help the FBI crack the code on that iPhone in question, but the commercial stakes for AAPL are much higher than that. Cooperating with the FBI would breach the Apple's competitive moat and has the potential to spell the downfall of the company. Smart beta products are a disruptive financial innovation with the potential to significantly affect the business of traditional active management. They provide an important component of active management via simple, transparent, rules-based portfolios delivered at lower fees. They clarify that what investors need from their active managers is pure alpha—returns beyond those from static exposures to smart beta factors. To effectively position themselves for this evolution in active management, asset managers need to understand the mix of smart beta and pure alpha in their products, as well as their comparative advantages relative to competitors in delivering these important components. As Blackrock is a supplier of "smart beta" fund products, are these authors talking their own book or is this truly a new form of financial disruption? Just as I started to write about the late cycle and reflation trade theme last week (see RIP Correction. Reflationary resurrection next? ), it seemed that the whole world was rushing to jump on this bandwagon.These conditions suggest that my thesis of late cycle sector leadership of capital goods and resource extraction industries should have some legs as the Street's stampede is just starting. Before rushing to hop a ride on the Reflation Express, though, I would caution that a couple of risks lie ahead. In the short run, the advance appears extended and vulnerable to a pullback. As well, the FOMC meeting next week could be a source of significant market volatility. Teach a man how to fish...he'll want to get a boat. If I know nothing about any of those things, how could I possibly know if anything I write is appropriate for you? I was asked recently why I don't post my portfolios and their performance. While posting my trades represent a disclosure of any possible conflicts in my writing, my own portfolios are a function of my own cash flow needs, my return objectives, my own pain thresholds, etc. How could any portfolio that I post be appropriate to anyone else? Your mileage will vary. This incident also illustrates the point of the do's and don'ts of reading the content on this website. Anyone blindly following my trades is in effect looking for a fish. But there is no fish. The markets are not easy. You have to build a boat that's right for you. I have two boats (used by my inner investor and inner trader). Taking a ride on either of mine by blindly following my trades means adopting my investment objectives and risk profile, which you know nothing about. The chart below shows an example of how my inner trader thinks about the stock market. He isn't always right, but he has been more right than wrong. His portfolio turnover averages 200% per month, which is not appropriate for everyone. Mid-week market update: On the weekend, I wrote that the stock market was experiencing a bullish breadth thrust and the market is likely to see a series of "good"overbought readings where stock prices either continue to grind up or consolidate sideways as they get overbought (see RIP Correction. Reflationary resurrection next?). So far, so good. The market seems to be behaving according to the script I laid out so far. As the hourly chart of the SPX shows. The market weakness on Monday and Tuesday were relatively minor. The index saw a minor positive RSI divergence and the 50 hour moving average has so far acted as support. 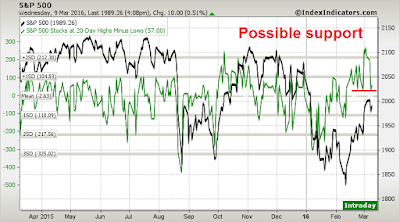 As well, this chart from IndexIndicators show that the net 20-day highs-lows, which has been a good intermediate term (1-2 week) trading indicator, seems to have found support at a high level. If this continues, it would lend support to the "good"overbought bull case. While I remain optimistic about the technical underpinnings of the bullish scenario, that`s only half the story. Throughout the most recent period stock market weakness, I steadfastly maintained that the market was just undergoing a corrective period and recessionary fears were overblown (see Why this is a correction and not a bear market published January 17, 2016). 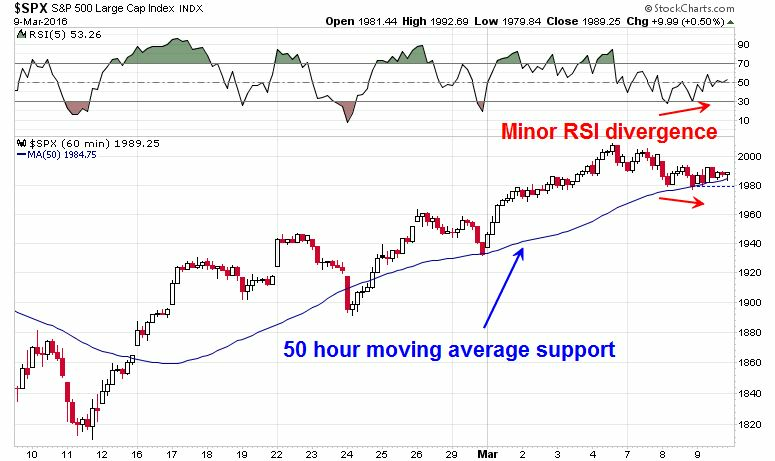 Now that signs of economic growth are returning and the SPX has rallied above its 50 day moving average (dma) and stayed there for a week, it`s time to move beyond the angst of a possible bear market and look forward to what`s in store for the rest of 2016. 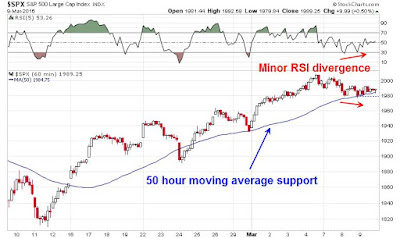 Mid-week trading update: Last weekend, I pointed to the analysis by Simon Maierhofer, writing in Marketwatch, who highlighted a bullish "kickoff" signal in which the SPX rose for 1.5% or more for three consecutive days (see The market 2-step: 1 forward, 1 back). Such "kickoff" signals have seen higher stock prices 12 months later. So far, the market is roughly acting according to that script. 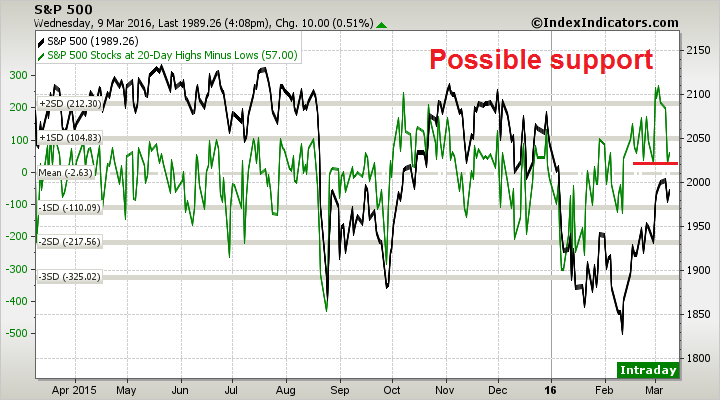 Two weeks after that "kickoff" signal, the market is overbought, which should be a cautionary sign for traders. However, such overbought conditions may be the start of a series of "good" overbought signals that accompany bullish thrusts. As the SPX approaches key resistance at about the 2000 level, the key test for the bulls is how stocks behave at these levels. Let me preface my remarks with two caveats. Firstly, I am politically agnostic and I don`t have a horse in the latest race for the American presidency. As a Canadian, I can`t vote in a US election. As well, it might be considered foolhardy to project what a politician might do based on his campaign promises, particularly during primary season. Nevertheless, as Donald Trump has strengthened in the Republican primaries and he has become a serious contender, it is time to consider what a Trump Administration might do (much in the spirit of my last post How to trade the Brexit referendum﻿).